If your list isn't making you money then you NEED this! Let Me Do The Hard Work For You... I Will Build The Relationship With Your List For You! Just copy and paste my 15 tried and tested high converting relationship building emails to finally get your readers loving you, reading every email you send, and spending their money with you! So here's the truth... If you don't build a relationship with your readers they will NEVER buy from you. That's why I've created these 15 relationship building email templates because it's vital that you start building a relationship with your list right now! They MUST like, know, and trust you before they will buy from you! When you use my email templates you will literally be able to add in YOUR info, and then copy and paste my tried and tested high converting relationship building emails into your autoresponder. You will never have to worry about what to send your fresh new subscribers, because I'm giving you all the emails you need that are designed specifically to build the relationship with your subscribers and turn them into massive fans that like you, respect you and buy things you recommend. When most people are struggling to get 5% - 10% email open rates I can get open rates as high as 76% talk about relationship building! All you have to do with these emails is edit them with your info, load them into your autoresponder, and then as people sign up to your list it automatically builds rapport and trust with them. This is truly one of the easiest automated systems you will get access to. This removes the uncertainty that so many people experience when doing email marketing. Build a solid relationship with your list on autopilot! Remove uncertainty involved about best way to build relationship with list! High quality offers sprinkled throughout that convert! Here's the bottom line... If you don't have the time to take care to build a solid relationship with your list, then this is for you! If you want to take a short cut in doing email marketing EFFECTIVELY and get better results, then this is for you! Getting people onto your list is EASY. Building a lasting relationship with them is the tricky part. With this offer I take care of that for you. Let me build your business and income for you. 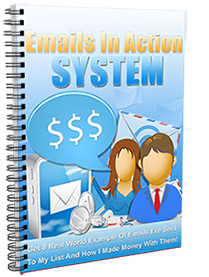 Get 8 Real World Example Of Emails I've Sent To My List And How I Made Money With Them! These 8 emails will give you a behind the scenes look at how I use email marketing in my business. You'll see what emails I send and why, and exactly how much money I made with the emails. This is a great hands on learning experience that will truly help you with your email marketing! 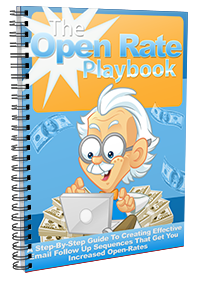 I decided to create The Open Rate Playbook when I saw how many people were struggling with getting their subscribers to open their emails. So I decided to put all my knowledge into a single detailed guide, so that you can massively boost your open rates…FAST. The more people who open your emails the more money you'll make... every single time! Get Theses Templates Today And Have Your Subscribers Loving You In Just Moments From Right Now! 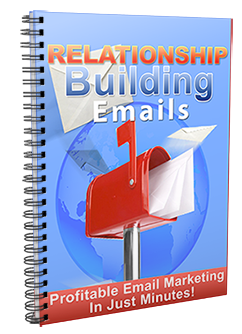 Get my relationship building email templates that you can use to instantly start building a relationship with every subscriber you ever get, PLUS these two killer bonuses for only $7! Today I'm giving you 30 risk-free days to examine these relationship building email templates. 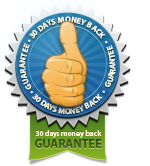 If you're unsatisfied for any reason, all you have to do is contact me within 30 days for a full and prompt refund. No questions, no quibbles, no hoops to jump through. I can't be any more fair than that, so get our your credit card and click the "buy now" button below to get started right now for the one-time investment of just $7! That's an insanely low price for this business building service, so make sure you click on the order button below right now, download the 15 email templates, and your other killer bonuses and get started taking your email marketing to the next level right now! Get All Three For Just $7!